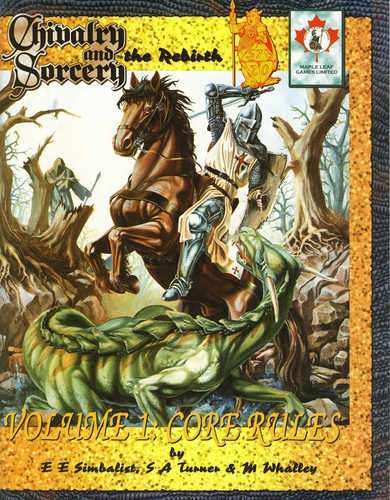 Brittannia Game Designs Ltd Chivalry & Sorcery Chivalry & Sorcery 4th Edition "The Rebirth"
Chivalry & Sorcery 4th Edition "The Rebirth"
C&S Rebirth Deluxe Set Three years in the making, twenty three years in the developing, this is the complete set of rules for Chivalry and Sorcery. Based on 3rd edition and incorporating the experiences not only of the designers but of the players themselves. I remember getting the first edition. It has always been the most historically accurate game, hardly any fantasy involved. These are scans of the somebody's personal copy of the books. It is not searchable nor linked. It is still great to have a pdf copy. The GM's book is awesome. Also, the scan of the 3rd book is not very good. - Old time C&S player. Vol 1 and 2 are now searchable, Vol 3 is still not searchable. I can't seem to checkout. It keeps returning me to the selection screen, and doesn't allow me to go to the checkout screen. Is this because I'm accessing from my droid? 2 products have the same display name in the list, but there are 3 different files. First off, thank you very much for your generosity for providing the free .pdfs. I've always been curious about C&S, now I've got my chance. One request. Could you provide new .pdfs with the color covers? Problems fixed - many thanks to Boris for assistance. Vol. 1 / Page 79 is missing!!! We are in process of fixing this.